If you aren’t in the design or construction businesses, you may not understand what the acronym “HVAC” stands for. It is commonly used throughout the building and design trades – and beyond – so knowing its definition could prove helpful to you. “HVAC” stands for Heating, Ventilation and Air-Conditioning. The acronym refers to the system in any home or commercial building that provides heat, humidity, air exchange and/or air conditioning to that space. HVAC systems can be powered by natural gas, propane, electricity, or even the earth (in the case of geothermal systems) making them one of the more complex systems in your home. An HVAC contractor needs to be trained in both plumbing and electrical work to do their job properly and safely. 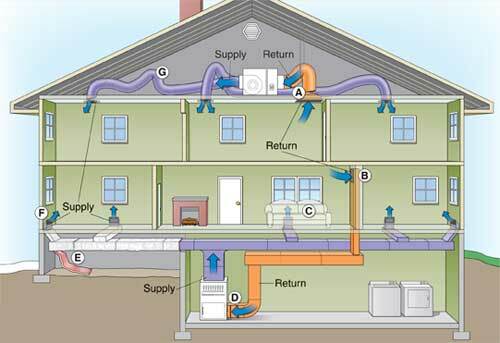 The HVAC system in any home or building is responsible for the health and well-being of the occupants of that building. Not only is the air in the home cooled or heated with the HVAC system, but it is also humidified or dehumidified (depending on the moisture levels in the air), and a poorly-running or poorly-designed HVAC system can promote the growth of mold and bacteria inside the building. A properly designed and efficient HVAC system can save you money in heating and cooling costs, as well. HVAC design, installation and maintenance is definitely work that you want to leave to the professionals. Choose an HVAC contractor in your area with the proper education, experience, insurance and credentials for the very best outcome. One Response to What is HVAC? The HVAC Mechanical Engineer designs or oversees the design of HVAC systems to meet specifications and coordinating budgets. Obtain engineered drawings and permits for in-house renewal projects.